Buying everything new can not only be expensive, but is also harder on the environment and can create unnecessary waste. 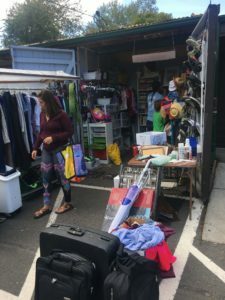 In a community as vibrant, sharing, and dynamic as Thurston County, it’s easy to find not only secondhand items, but even ones for free. With a little creativity and determination, it can be both easy and fun to check items off your shopping list without spending anything. Clothing swaps are a community practice where guests bring unwanted clothing (or clothes that kids have grown out of), and trade them with others. Clothing swaps can be an excellent way to get rid of old articles of clothing and find new, previously loved items while meeting new people, connecting with the community, and practicing environmental and financial responsibility. Much like The Freecycle Network, Craigslist is a classified advertisements website that offers a free section, where users can post items that they are giving away. With a quick look through the Craigslist free section, I was able to find furniture, a color printer, a rooster, building materials, children’s clothes, a piano, and a bike. Nextdoor, a free private social network for neighborhoods, also offers a “For Free and Sale” section of the website. Users can either create posts for items they are giving away, or create wanted ads for things that they are hoping to find. Aside from finding items for free, Nextdoor can be a fun way to connect with neighbors about a variety of subjects. 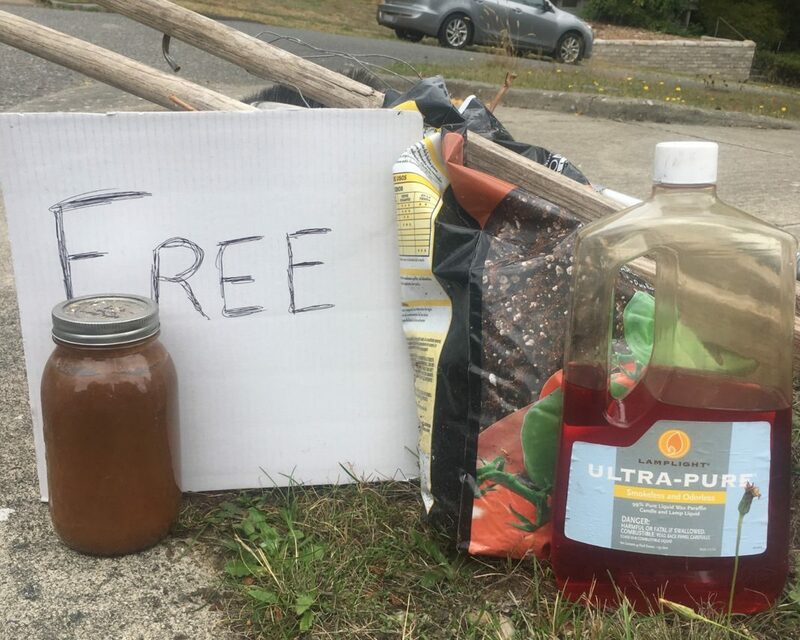 On Nextdoor’s For Free and Sale page, I turned my settings to only show free items, and found a puzzle, garden plants, firewood, a toddler pool, a couch, and many postings about garage sales and free piles around my neighborhood. 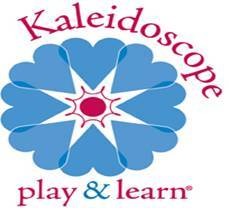 Thurston County also has our own online resource for free items, called 2Good2Toss. 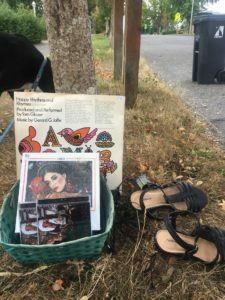 Self-described as “Thurston County’s Reusable Materials Exchange,” this website includes both “offering” and “wanted” posts, and offers items such as a dog crate, an electric lawnmower, a futon, ski boots, solar hot water collectors, potting soil, and a chest of drawers. There are also many Facebook pages, such as the Buy Nothing Project, that are designed to aid individuals in finding and getting rid of free items. When gifting or getting something through an online resource, remember to practice safety by never sharing personal information online. If you meet with someone in person for an exchange, remember to meet in a public place, and consider bringing a friend along. 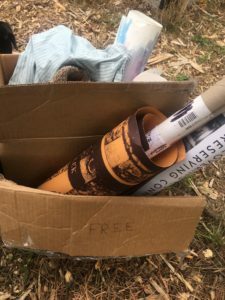 A simple walk around the neighborhood can usually result in finding piles or boxes of free items. These are often leftovers from yard sales, or simply items around the house that a neighbor didn’t want. Olympia has two established free stores, the Olympia Food Co-Op Free Store, and the Free Store at the Evergreen State College, located inside the Housing Community Center. Free stores are volunteer-run locations where donations are sorted and offered for free to the community. Free stores were conceptualized in the mid 1960s by the Diggers, a counterculture group known for distributing free food and political and philosophical literature. One early free store displayed a sign reading “No owner, no manager, no employees, and no cash,” demonstrating the non-hierarchical nature of free stores. The free stores of the 1960s primarily distributed surplus food, and later developed to include all kinds of items. 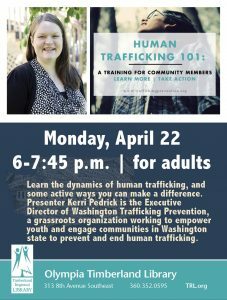 The two free stores in Olympia rarely include food, and usually offer clothing, books, household items, and similar items to the community. Both free stores are entirely volunteer-run. Finding free stuff can save you cash while reusing the unwanted items of your neighbors and building community through sharing and generosity. While it sometimes takes more work to find things for free than buying them new, think about utilizing some of the above options next time you need to make a new purchase.